A statement released by the police command's spokesperson, CSP Chike Oti, says Folake was found inside a tunnel, under the Cele Nicer Bridge, Ijanikin, Lagos with a decomposing human body. The discovery attracted an irate mob which nearly lynched her but was saved by the quick intervention of a contingent of policemen drafted from Ijanikin Divisional Police Headquarter, who raced to the scene. 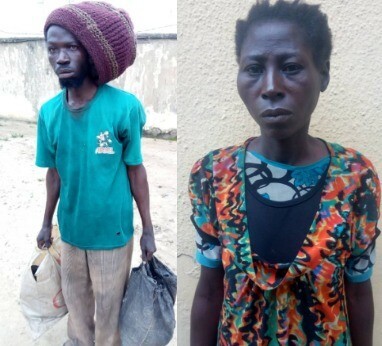 The rescue team thereafter searched the tunnel and arrested one Emmanuel Gbenga believed to be an accomplice of the female suspect while the third suspect who escaped from the tunnel to avoid being arrested was caught by an irate mob who set him ablaze. The state Commissioner of Police, CP Imohimi Edgal, has directed the Divisional Police Officer in charge of Ijanikin to cordon off the scene and ensure that the remains found in the tunnel are not tampered with pending the arrival of police forensic experts expected at the scene today 28th August for scientific examination of the corpse, the tunnel and other exhibits found therein. Imohimi said it is regrettable that despite the various townhall meetings he had held to sensitise communities in the state to the evil of jungle justice, some people at Olorunshogo community constituted themselves into a mob and took laws into their hands by killing one of the suspects who might have been very useful in the ongoing investigation had they handed him over to the police. He warned that anybody found to have participated in the killing of the yet-to-be-identified man, will be arrested and charged for murder to serve as a deterrent to others with penchant for taking the law into their own hands.